You don't need special headphones to hear all the griping about Apple nixing the headphone jack. After months of rumors and criticism online, Apple (AAPL) confirmed Wednesday that it will eliminate the 3.5mm headphone jack from the iPhone 7 and iPhone 7 Plus. Those who buy the newest iPhone will either have to go wireless with Bluetooth headphones, buy a pair of corded headphones that can connect through the Lightning port (the one you use to charge your phone), or else get a Lightning adapter to use with the headphones you already have. In case you've been too busy cursing Apple to read all the details about how this will work, here's what you need to know. That was the answer Phil Schiller, Apple's SVP of worldwide marketing, offered on stage Wednesday when announcing the elimination of the headphone jack. It's about the "courage to move on," he said, and embrace the next generation of wireless technology while also potentially improving the sound quality of corded headphones through the Lightning port. OK fine, but really, why? Because Apple can. Removing the headphone jack frees up more room under the hood of the iPhone. That is a precious commodity given Apple's fixation on making the phone thinner, lighter, faster. Apple has killed off standard technology features before (remember the CD drive?). By doing it now, Apple gets some outrage out of the way before next year when it's expected to overhaul the iPhone for its tenth anniversary. 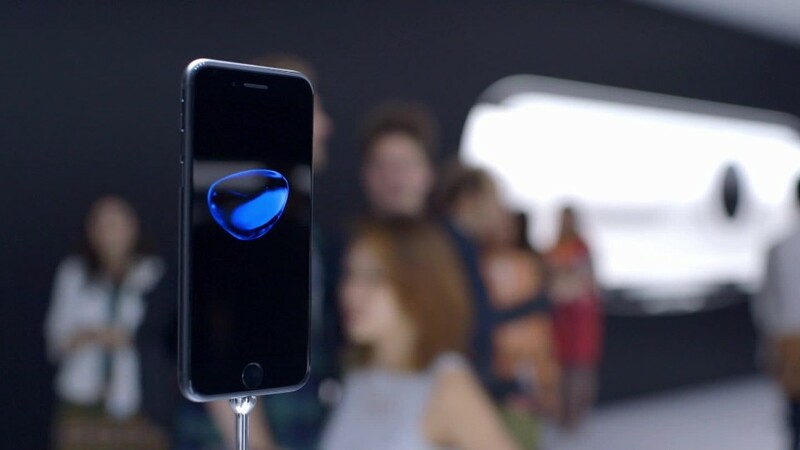 Will Apple give me Lightning-compatible headphones with the iPhone 7? 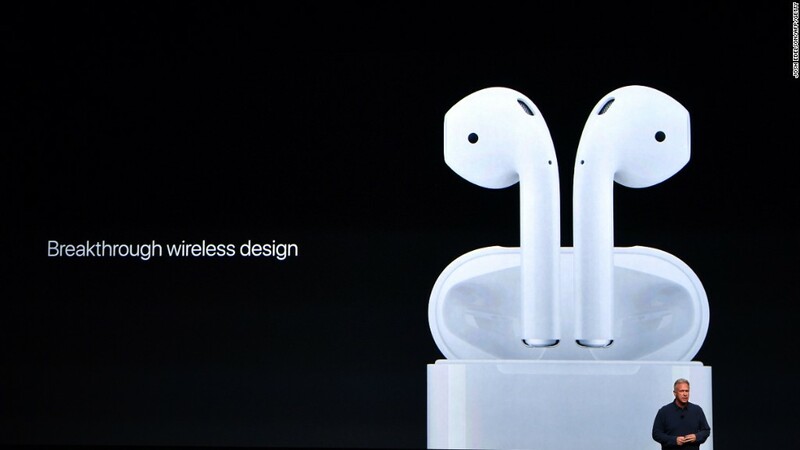 Yes, and they look just like the usual white headphones Apple gives out, but one end looks like a charging cable. Will Apple give me a free adapter with the new iPhone? Yes. We all get adapters -- or as the Internet likes to call it, dongles. 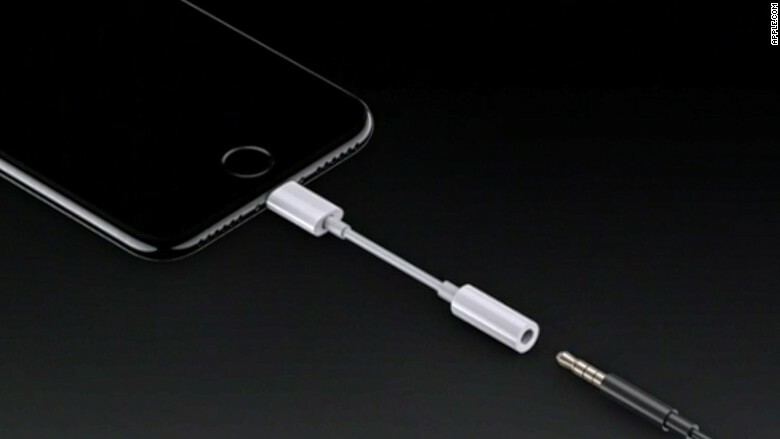 You plug this piece into the Lightning port, then plug the headphone into the dongle. What happens when I inevitably lose the dongle? You can buy another dongle for $9. And then another one after that. I hate this. Why is this happening? OK. How do the AirPods feel? 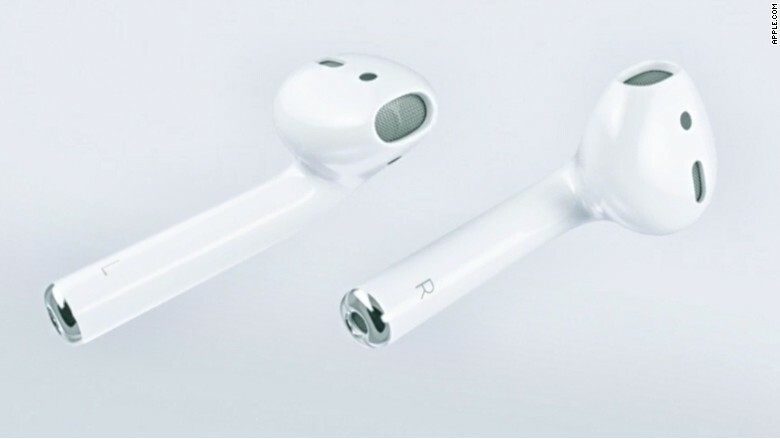 As CNNMoney reporter Heather Kelly put it after trying the headphones, "Imagine, if you will, a pair of classic white Apple headphones. Now take scissors and chop off the wires. You have a pair of headphones that feels the same, but untethered and itching to get lost. At $159, that feels like a big risk to take." Do I have to charge the AirPods? Yes. You now have one more Apple product that needs to be charged. According to Apple's website, each full charge gets you five hours of listening time. But if you carry the AirPods case around, you'll get additional charges on the go. Is there any protection in case I lose AirPods? Are there corded headphones available right now that work with the lightning port? Most headphone makers now offer Bluetooth options that will work with the iPhone. In fact, this option already accounts for the majority of headphone sales (by revenue) in the U.S., according to NPD. Some, including Philips, Brightech and now Apple also sell corded headphones that connect to the Lightning port. Can I listen to music and charge my phone at the same time? Yes, but only if you are listening to music on wireless headphones -- or spend $40 to buy this adapter . Otherwise you're out of luck. Will I ever fill the 3.5mm hole in my heart? No. Now go listen to some sad music.